The Emporia Convention and Visitors Bureau is accepting Veteran Profile Information forms for inclusion in the next All Veterans Tribute tabloid listing of military veterans. As the founding city of Veterans Day, Emporia, Kansas hosts the All Veterans Tribute every November. The Tribute is a series of events dedicated to honoring veterans. The All Veterans Tribute tabloid is published by The Emporia Gazette and includes names of military veterans who have completed and submitted a Veteran Profile Information form to our office. If you have not submitted a form and would like to have your name included in the listing see links below. A family member can complete a form for a deceased veteran. Profiles must be completed by October 1, for inclusion in the November list. The founding city of Veterans Day, Emporia, Kansas, hosts the All Veterans Tribute every November. The Tribute is a series of events dedicated to honoring Veterans. The Emporia Convention & Visitors Bureau continues to compile a database of Veteran Profiles for the All Veterans Tribute. 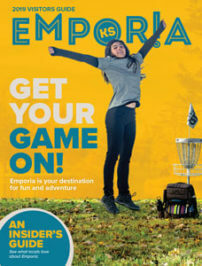 If you would like information included about the Military Service of a Veteran in the All Veterans Tribute tabloid, please fill out this Veteran Profile form and submit it to the Emporia Convention and Visitors Bureau.Disclaimer: Our primary concern is the respect and right to privacy of our Veterans. Please note that the information contained on this form will ONLY be used for the All Veterans tab printed by The Emporia Gazette. Please understand that the information on the Veteran Profile form will not be given or sold to any other agency, organization, group, or business.